Michael Holm crosses the finish line at 4 hours and 50 minutes. Feet bleeding or blistered, legs cramping, heart pounding, head hurting and lips forcing a triumphant smile. This is the appearance of almost every marathon runner as they cross the finish line. For many people, running a full marathon for the first time is one of proudest moments of their lives, I am lucky to be one of those people. Only 0.5% of the American population is, and only 3% of that 0.5% is under the age of 20. But what goes into this painful, delirious and glorious finish? Months (if not years) -depending on your level of fitness when starting training- are necessary to conquer the 26.2 daunting miles. I was lucky enough to train with my good friend Michael Holm and highly recommend going through the training process with someone close to you. This is because in these months of hard work, almost any first time marathoner, regardless of initial fitness, will learn a lot about their body and their mind and it is extremely helpful to have someone to share that experience with. Training begins lightly -while some runners who have already been training can go out and run a half marathon right off the bat, most people will be starting off with very minimal distance (2-5 miles). In these lower mile runs it is important to find a comfortable rhythm and pace as well as finding out what pre-run rituals help you. For example, some people need to stretch out far more than others before they begin a run. I personally do not stretch at all. Once minimal distance has been conquered, things start getting fun. One long run a week or every two weeks, depending on length (10-18 miles depending on which part of the training block you are in) is necessary. It is important to begin eating and drinking water on these longer runs. Testing out what kind of nutrition fuels your body the best and how much water you need is pivotal for a healthy training experience and ultimately race day experience. Some people (myself and Michael included) elect to purchase a running fanny pack to carry our supplies and water on long runs. I highly recommend the brand Ultimate Direction, while they are more expensive than some competing brands their belts do not bounce around while running and after just a few runs feel natural and comfortable to run with. Michael and I both buy our “go juice” (otherwise known as nutrition gummies) at Jax. After the heart of your training is over and the marathon is approaching you need to back off the training, no matter how much fun you are having. A month away from the marathon you should not go on any runs longer than 14 miles and you should give yourself more rest days. Once the marathon is two weeks away or less do not go on any runs longer than ten miles. In the last week it is important to limit yourself to runs under six miles and give yourself three days of complete rest leading up to race day. This taper will help your body recover and allow you to feel fresh on race day. 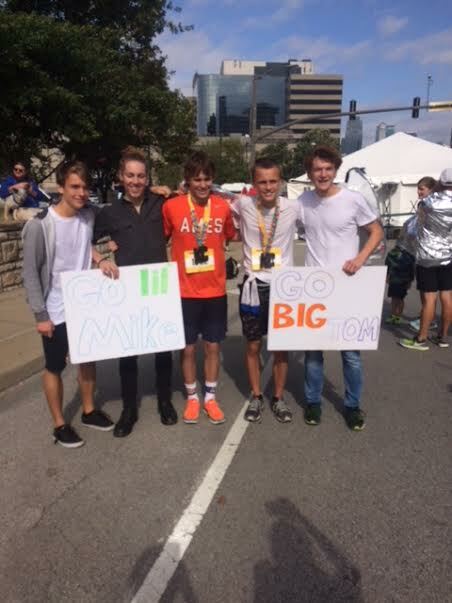 German exchange student Charles, Seamus O’Connor, Thomas Delay, Michael Holm, Ryan Mills stand together after marathon. All this nutritional and training advice is useful and will help you – but if I’m being completely honest, nothing can truly prepare you for 26.2 miles. It hurts like hell, unless you are having a magical day at least one part of your body will feel like it is going to explode and by the end of the race you will smell so bad your mother won’t want to sit by you. I felt great for the first 22 miles (keeping an 8:50 mile pace) but as soon as mile 23 rolled around my left hamstring cramped so bad I almost couldn’t move it. I panicked, I swore, I almost cried but in the end I finished. This is what makes running beautiful, as many great runners have said, distance running is like living life in a day. There are moments where you are on top of the world and and moments you are in hell and all you want to do is to quit but you don’t, you just keep pushing and in the end, you are a better person than when you started. 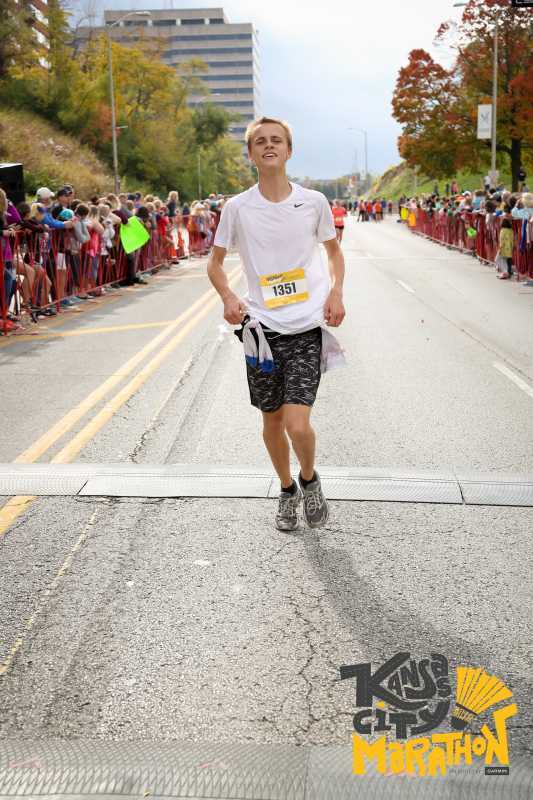 Michael experienced a similar trial, cramping rather badly at mile 18 and having to push through 8 miles of adversity but eventually finishing. My final time was 4 hours, 19 minutes and 35 seconds, Michael’s was 4 hours 50 minutes. Anyone who reads this and is thinking about training for a marathon (or even a shorter distance race) feel free to talk to me. Distance running is my passion and I’m happy to share it with others. Also I need to give a huge shout out to Seamus and Ryan for coming down to Kansas City just to cheer Michael and I on, running is easier when you have great friends to support you.